SoftPlanet makes it possible for everyone to get free EMCO Malware Destroyer download directly from our servers. There is no registration needed for downloading. EMCO Malware Destroyer 7.1.20.115 is a really interesting software tool that seeks and eliminates malware that sits on your PC and hinders its work. The good news about this one is that it comes with a really fast scan engine that needs just about 10 seconds to produce a complete analysis of your PC. The analysis includes more than 10 000 threat definitions that include trojans, viruses, worms and other malicious software. In addition EMCO Malware Destroyer 7.1.20.115 is fully supported software that receives frequent updates so you will know that you are always protected even from the newest malware out there. Best of all – this software is free! EMCO Malware Destroyer 7.1.20.115 includes several key features that can make this malware tool a winner. It does come with broad operating system support that goes back as far as Windows 2000 SP4 and features an easy and fast installation process that is straightforward and quick. 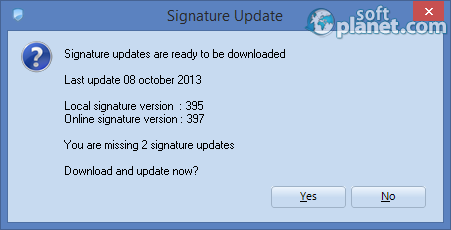 It does not take long to get this software installed on your PC. 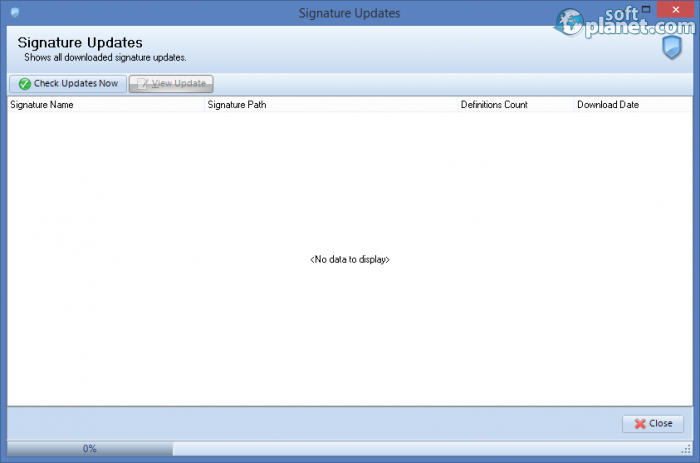 The update process is fast and so is the scan process so by using EMCO Malware Destroyer 7.1.20.115 you will not waste a lot of time while the computer scans for malware. All great anti-malware tools in one place – this is what EMCO Malware Destroyer 7.1.20.115 is! The interface of EMCO Malware Destroyer 7.1.20.115 is both similar to your regular Windows program and at the same time it isn't. The program runs in an adjustable program window that features a File-Help list of menus. Below it you will find a few buttons that allow the end user to perform various PC scans, download a network version of this program, update virus definitions and view quarantined files and failed tasks. Then you will see a large pane where all the action takes place – it shows you the progress of the scan and the ongoing results. Finally right at the bottom of the program window you will find three tabs that list the scan statistics and results and the scan management of the program. 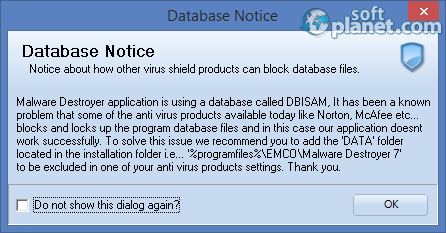 Being a malware killer EMCO Malware Destroyer 7.1.20.115 works just like any other anti-malware program. To start using it you must first update the malware definitions the program comes with – otherwise you will not be up-to-date and the program might miss malware here and there. Then select the type of scan that you wish to have and wait for the program to finish – something that will not take long as EMCO Malware Destroyer 7.1.20.115 comes with a really fast scan engine. 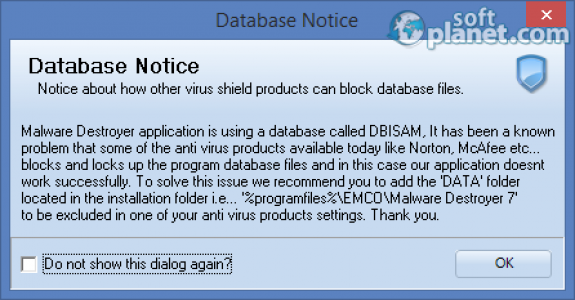 EMCO Malware Destroyer 7.1.20.115 is a piece of software that you should take a look at. It installs nice and easy and then allows you to scan your system in almost no time as it comes with a really fast scan engine. You will not experience a steep learning curve as this software is also easy to use. Best of all EMCO Malware Destroyer 7.1.20.115 is free so download and enjoy this program today! EMCO Malware Destroyer is VIRUS-FREE! Our security scan shows that EMCO Malware Destroyer is clean from viruses. The current version of EMCO Malware Destroyer has been scanned by our system, which contains 46 different anti-virus algorithms. That ensures that EMCO Malware Destroyer 7.1.20.115 is 100% safe for your computer.